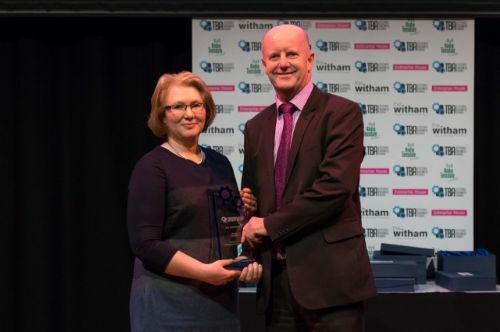 Feb 18th I attended the Teesdale Business Awards at The Witham Hall in Barnard Castle. I was delighted to be a Finalist for 2 Awards. 'Most Innovative Business and Sustainable Business of the Year. a on-line magazine featuring all things wooftastic! This month we were delighted to have a lovely review in Dogue Magazine UK. This is a brand new Network for Women and their dog. Wellybix has been shortlisted for 2 Business Awards this month with Teesdale Business Awards, Based at Enterprise House, Barnard Castle. Most Innovative Business and Sustainable Business of the Year. 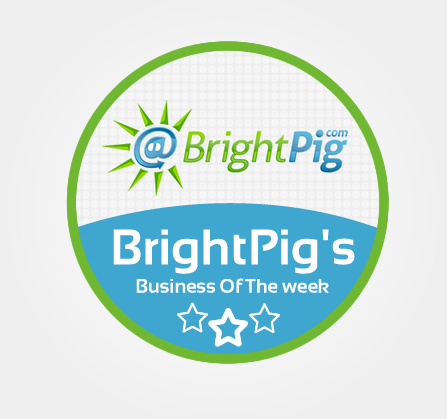 Wellybix was chosen to be Bright Pig's Winner of Business of the week!! Look who’s in the June edition of Vogue! 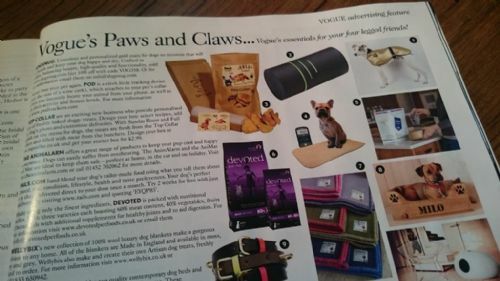 Featured on a page, ‘Paws ‘n’ Claws’ with our Doggie Blankets! I was delighted to have been shortlisted but didn't expect to win so a fabulous night was had by all! A Teesdale company is celebrating a year in business with an expansion that will see it double in size. 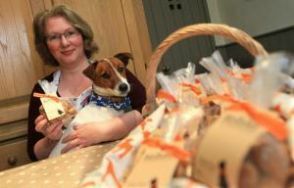 Westmoorland group to sell her handmade dog treats in outlets from Penrith to Gloucesterhsire. The company was started after Mrs Walton gave up her job as a pastry chef in a local hotel after 12 years. Mrs Walton now works with a veterinary laboratory to ensure complete nutritional standards and quality. She said: "I decided to bake some biscuits for my own Jack Russell, Welly. They worked really well and I began supplying local hotel and holiday cottages with biscuits to give to clients who brought their pets on holiday with them. I have now taken on another local baker and agreed to supply five outlets in the Westmorland group." Tickling canine tastebuds is something Alison Walton knows a lot about, thanks to her pet dog - Jack Russell Welly. 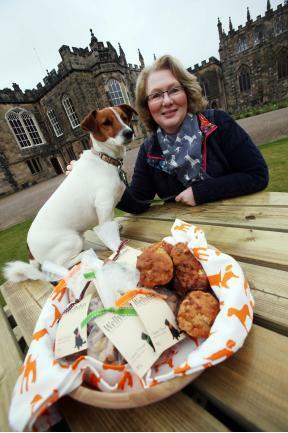 She hand-bakes healthy treats for dogs and now supplies local hotels and holiday cottages. The treats, which are nutritionally approved by a veterinary laboratory, are available in three flavours, chicken and thyme, lamb and rosemary, and beef with wheat bran. There is also a wheat-free variety, peanut butter with spelt, because some dogs suffer from wheat intolerance. Alison Walton, of Barnard Castle, set up Wellybix last year and has not looked back since. Two-year-old Welly does his bit by ensuring baking standards are met. He is my chief tester. He waits for each batch to come out and makes sure they are up to scratch, says Alison. Her cottage industry now supplies pet shops and farm shops in County Durham, Cumbria, North and West Yorkshire. Wellybix is at Raby Castle Food and Craft Fair, Staindrop, on Saturday, May 25th. 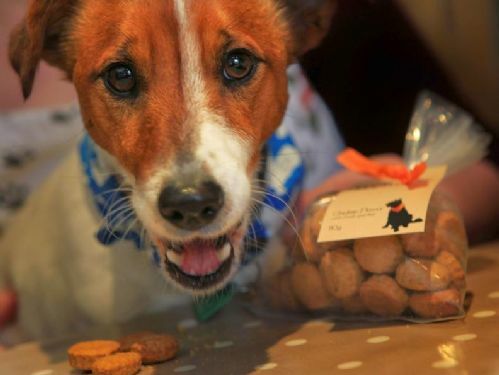 He's the chief taster for Wellybix, a thriving cottage business making doggy treats run by keen baker Alison Walton, of Romaldkirk, near Barnard Castle. Her business began almost by accident after she decided to bake some biscuits for Welly shortly before Christmas of 2012. Soon after she began supplying a local hotel and holiday cottages for guests to give their dogs - and now she supplies pet shops and farm shops around the region. Welly does his bit by enthusiastically testing each batch to ensure quality control, as well as lending his moniker to the company name. The biscuits come in a range of doggy-licious flavours including Chicken and Parsley or Thyme, Lamb and Fresh Mint or Rosemary, and Beef with Wheatbran.There's even a wheat-free variety, Peanut Butter with Spelt Flour, as some dogs suffer from wheat intolerance. TASTY treats for man’s best friend will be on offer from a fledgling business visiting the Bishop Auckland Food Festival. Alison Walton set up Wellybix after making her dog Welly some biscuits before Christmas 2012. The keen baker, of Romaldkirk, near Barnard Castle, received such positive feedback after handing out the treats as presents to friends with dogs, she decided to set up her own business. Less than 12 months on, Wellybix products are on sale in more than 20 outlets, and Mrs Walton is looking forward to sharing them with more people at this month’s food festival. Mrs Walton said: “I had to give up work to care for my mother and it was at that point I thought I can now have a dog. 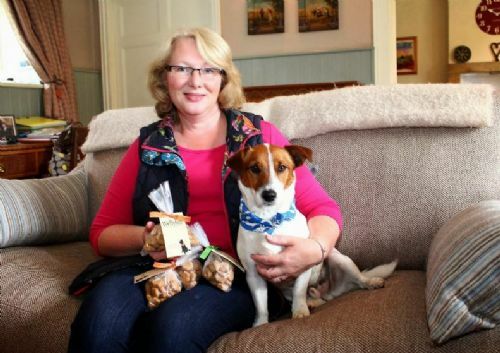 BIGGEST FAN: Alison Walton, of Romaldkirk, has set up a dog biscuit company Wellybix after her dog Welly fell in love with her baking“I decided one day to make some biscuits for Welly, which is where the (company) name came from and it just went from there. “I started to research it on the internet and discovered it is the fastest-growing new start-up business in America. 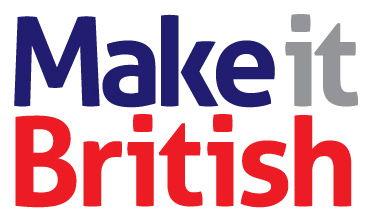 I got loads of ideas, made them and handed them out. People said I should sell them. She started selling them at craft fairs, but now plans to expand her audience with a number of food festivals, including Bishop Auckland and Leyburn. In addition to biscuits, she is now selling dog cupcakes, which are also proving very popular. “I am very passionate about what I am doing and I think that is the driving force. I haven’t been to the Bishop Auckland Food Festival before, so I don’t know what to expect. THERE will be something to tickle everyone's taste buds at a popular food festival this month, including the four-legged visitors. 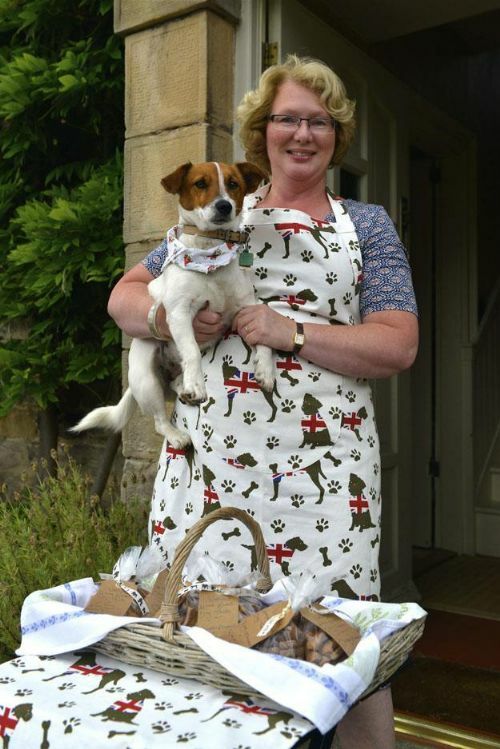 Alison Walton, of Barnard Castle, will be taking her hand-baked healthy dog treats company Wellybix to the Bishop Auckland Food Festival. “I'm really excited about doing the food festival,” she said. "It's great that we have such a fantastic location on our doorstep for this event. “Everyone is so interested in local food and producers these days; how brilliant that there will be the chance to wander around and try so many locally-produced goodies here in County Durham. She set up Wellybix in 2013 after she began supplying local hotels and holiday cottages with her products. 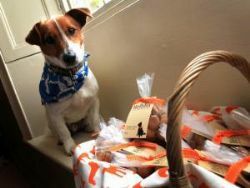 Approved by a veterinary laboratory, the treats are available in three flavours, all of which have been personally approved by her two-year-old Jack Russell, Welly. There will also be a wheat-free treat for pets who suffer from a wheat intolerance. A ROMALDKIRK pastry chef’s career has, quite literally, gone to the dogs. Alison Walton gave up her job at the Rose and Crown in the village, initially to become a carer for her mother, but now has a thriving cottage industry making dog treats. "I hadn’t anticipated doing this at all, it just happened over night. It mushroomed,” she said. Her business had its grounding last Christmas when she decided to bake some biscuits for her Jack Russell, Welly. "I looked up on the internet and looked up some recipes in a dog recipe book,” she said. It wasn’t long before she began supplying the local hotel and holiday cottages with biscuits to give to clients who brought their pets on holiday. Spurred on by the initial success, Ms Walton set about formalising her business coming up with the name Welly-Bix after her Jack Russell and sending the biscuits off to a veterinary laboratory for complete nutritional analysis. Two-year-old Welly does his bit by ensuring baking standards are met. Ms Walton said: “He is my chief tester. He waits for each batch to come out and makes sure they are up to scratch.” The home industry now supplies pet shops in Barnard Castle and Richmond as well as the Post Office in Cotherstone. Recently Welly-Bix became part of the Gentian shop-share scheme in Barnard Castle and Ms Walton has been pleasantly surprised by the reaction. “It’s doing quite well and ticking over nicely,” she said. Ms Walton said the popularity of the biscuits possibly mimics what is happening in America where, she said, dog bakeries are the fastest growing business. Ms Walton takes her products to country fairs and markets and sales are such that she is baking dog biscuits almost every day. Welly-Bix are available in chicken and parsley, lamb and fresh mint and beef with wheat bran flavours. Ms Walton also bakes a wheat-free variety, because, she says, some dogs also suffer from wheat intolerance. This Christmas she plans to expand the range by introducing turkey and cranberry and a mock mint and chocolate. “Dogs are not allowed to eat chocolate so I’ll be making them with carob powder. It tastes just like chocolate,” she said. Ms Walton is hoping they will be big festive sellers. “Surely everybody buys treats for their dogs at Christmas,” she said.